We’d each strongly felt the pains of trying to observe users’ behavior within a SaaS product, and communicate with those users at scale based on their individual behaviors. And we were excited at the prospect of building a combined user admin panel + communication tool to solve those pain points for other founders. But we weren’t interested in joining the thousands of founders before us who’ve launched a product to scratch their own itch… and no one else’s. 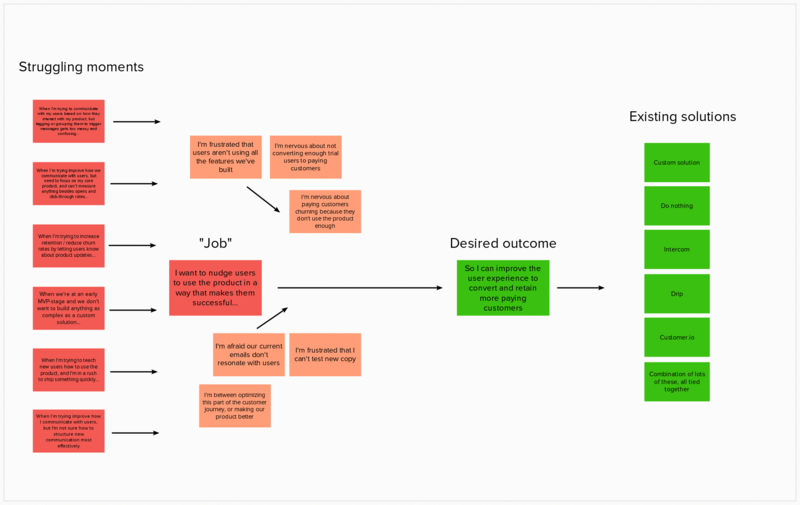 So before Jane designed a single piece of our UI, and before Benedikt wrote a single line of code, I went into research mode to understand whether other self-funded founders experience the problems Jane and Benedikt faced when building their previous product. Pre-S: at the end of this post, I’ve shared the interview questions & spreadsheet template I created to guide this process. You’re welcome to grab a copy of both below! 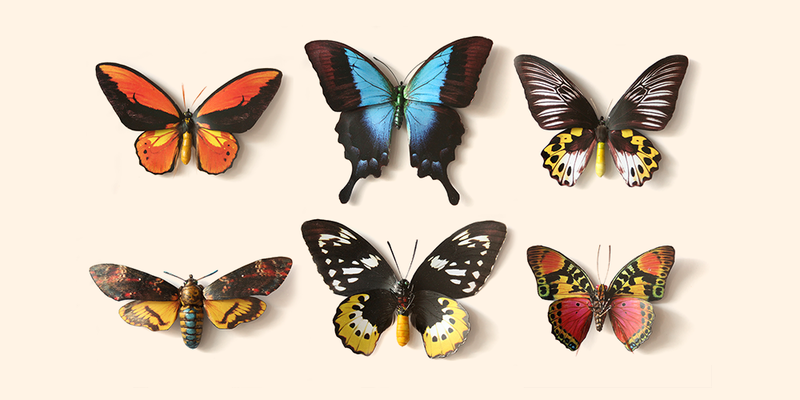 Defining your ideal customer means getting much more specific than saying you serve “SMBs” or “founders.” If you’re B2B, what company model does your ideal customer own or work in? What industry or niche? How mature is their business? Is it profitable? Well-funded? Lean? Rapidly expanding? What challenges do they face in doing their work well (or better)? For us, defining our ideal customer was relatively easy, since Jane and Benedikt were already active members of the community they wanted to serve — and I had several friends who fit the mold, as well. My goal was to get at least 20 phone calls booked with folks who fit these criteria, and to conduct at least 10–15 actual calls. Booking at least 20 would help account for people who had technical difficulties, or had to cancel last minute. While it would’ve been lovely to speak with 50 or even 100 ideal customers at this stage, our goal was to get just enough information to work with — those key details that would help us release an MVP, after which we could iterate and improve. To my great appreciation, Jane and Benedikt sourced the majority of interviewees — mostly through their personal networks, Slack groups, and Twitter (a huge benefit of building a product for an audience you already know and interact with). 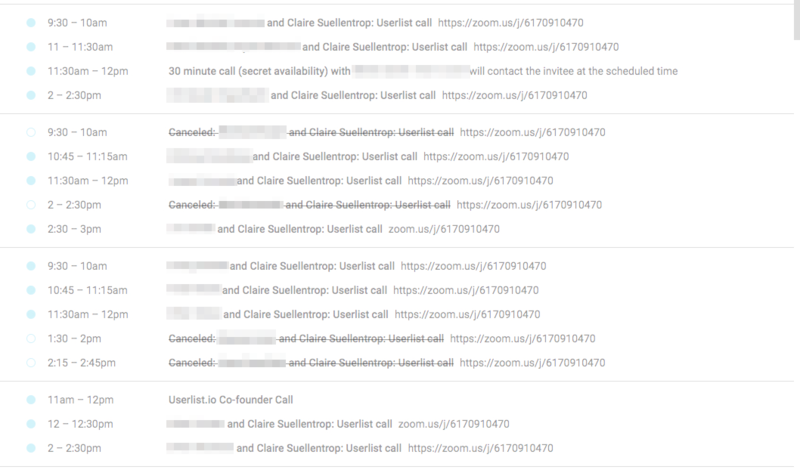 I set up a Calendly event called “Userlist.io Call,” shared that link with Jane and Benedikt, and watched as the calls rolled into my calendar. All in all, I ended up with 16 calls booked, and 12 actually held (after accounting for cancellations). Not bad! With 16 calls on the calendar, it was time to assemble some interview questions. What’s important: the questions I chose for these interviews were slightly different than the questions I’d use when speaking with paying customers of an existing product. Gaining this understanding would pull us out of the weeds of the problem we’d identified from our experience, and help us see more clearly whether it was the right problem to pursue, or whether a much bigger problem existed that was worth tackling. This approach was based on Jobs To Be Done — a behavioral theory that focuses on the motivations and challenges behind why people buy and use products (vs. demographic data, which rarely uncovers why people buy or use something). How do our ideal customers currently organize, observe, and leverage their users’ behavioral data? How do they communicate with users at scale, based on users’ behavior? Did we indeed have an opportunity to solve a pain point? So I had to take each interviewee back in time, to the moments they made decisions about how they would accomplish these tasks. Apart from confirming that interviewees met our ideal customer criteria (self-funded, running their company solo, or working with a very small team), we did very little pre-qualifying. Our goal was to hear from founders at many different stages of company growth: problem-solution fit, product-market fit, growth, and scale. At the end of the process, our interviewees all fell into one of those first three stages: problem-solution fit, product-market fit, or growth. So…how were these founders observing their users’ behavior, and communicating with those users? Let’s say I was on a call with someone using a custom-built user admin panel plus Intercom. What events or situations led up to the problem we want to solve? How do people decide to solve that problem right now? What’s still not working about existing solutions? Based on interviewees’ emotional reactions to their current ways of observing and communicating with users, it was clear we were on to something. I recorded every call, which allowed me to give each interviewee my full attention, and then uploaded each recording to Rev.com. In 24 hours or less, I’d have the transcript back — and with 12 calls complete, I was ready to settle in for a month of deep data review. Based on the conversations held with these 12 founders (plus one audio rant Amy Hoy recorded and published, which happened to be extremely timely and relevant to us), we could’ve started building our MVP with 25 different features. Different people needed different things, at all different levels of urgency. So, how did we figure out what mattered most? 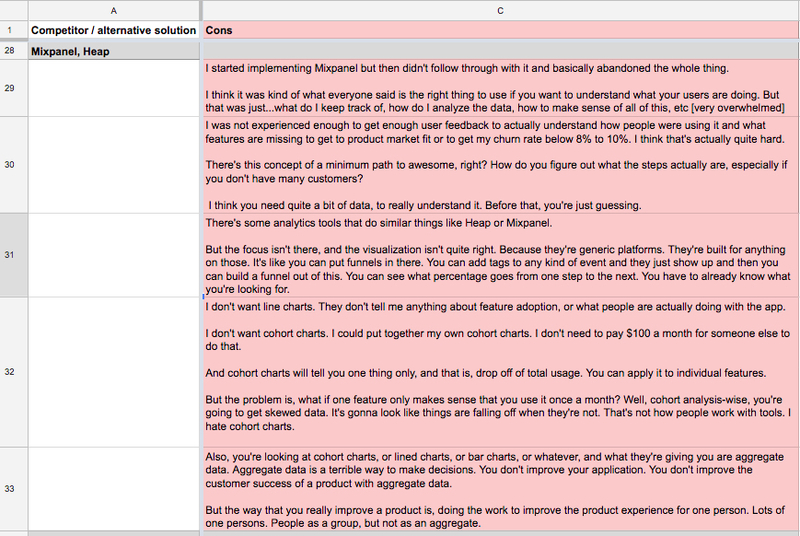 By distilling dozens of pages of qualitative data into… a very unsexy spreadsheet. Below are the three questions I used to organize our data. Question 1. Are enough people motivated to solve this pain? Or is there a stronger pain somewhere else? The first step was to make a list of all the various pain points interviewees had shared during calls. My goal was to identify which pain points interviewees were most often motivated to solve, and which pain points could be excluded as edge cases. As you can see, many interviewees wanted to improve how well they guided users through their product — which validated that the pain point Jane, Benedikt and I are trying to solve is real, and commonly felt by our ideal customers. While the blue problems are no less legitimate (or important to a successful business) than the dark red, relatively few founders in our sample size were as concerned about the blue problems as they were about the red. With validation that the pain point we’re trying to solve — “I want to nudge users to use the product in a way that makes them successful” — is real and widely-felt, we could safely narrow our focus to just this pain point, and ignore the others for now. What events / situations most often trigger this pain? What’s the “better life” founders envision for themselves as they try various solutions? Question 2. What common events or situations trigger this pain point? Next, we needed to figure out which events or situations were occurring in founders’ workflows, that most frequently cause this pain point to arise. This would help us understand what events along a founder’s journey would most likely trigger that founder to seek out (and adopt) a new solution. Remember: during my interviews with founders, I was trying to create a mental timeline of each founder’s decision-process. So I reviewed the transcripts in which our chosen pain point came up frequently, and looked for patterns in those founders’ stories. Red: situations that cause founders pain (“struggling moments”). Orange: motivating factors pushing founders to seek a new solution. Green: desired outcome, and existing solutions for achieving that outcome. If we get our product on founders’ radar while they’re still in ideation phase, before they’ve begun building their product, we could save people TONS of time/effort – which many of them are currently spending building admin panels by hand. If we provide foundational analytics about user behavior, founders may never need to bother with bulky analytics tools designed for much larger, mature companies. On the other hand, if they’re already a power-user of a tool like Kissmetrics or Mixpanel, they may not be a fit for Userlist.io. Even founders who de-prioritize user communication in the early days of their product (e.g. in favor of concierge onboarding) will eventually want to optimize the messages they send to users. If we can help a founder publish their first basic time-based onboarding email, then collect user data in the background for a while, that founder will have everything they need to send super-effective event-based emails down the road. This was helpful not just for early product development, but from a marketing and overall business perspective as well. For example, we know we’ll need to make founders aware of Userlist.io extremely early on in their product-building journey — otherwise, we could miss the boat, and they’ll become too comfortable with a homegrown user admin panel + other email solution… and both of these require lots of effort to migrate away from. With these learnings in mind, we were ready to examine the existing solutions founders use in these situations. Sidenote. Some of the founders I interviewed expressed no pain points related to building their own user admin panel, and actually preferred to build as much as possible by hand — including emails, analytics tools, etc. We chose to exclude data from interviews with these founders (intentionally creating a sampling bias). While we recognize some founders may never see the value of a done-for-you tool, we believe — based on the quantity of founders who did want to avoid hand-coding everything — that a healthy percentage will! Question 3. What existing solutions do we not want to compete with? We believe the customer communication space is a large one, and that many competitive solutions can co-exist. However, we wanted to avoid going up directly against the clearly incumbent products that it would be most difficult to pull users away from. That meant analyzing the feature sets of solutions founders currently use, figuring out what founders love and hate about those solutions, and being extremely selective about which features our MVP would include. Pre-signup marketing communications. With umpteen email marketing tools already available, we’re not interested in building yet another way for people to capture leads outside of their products, and nurture those leads into trials.However, many founders currently force pre-signup marketing tools (e.g. Mailchimp, Drip) into their users’ post-signup experience, with much frustration – and we’re very interested in solving that problem. Robust analytics. There’s no way we can (or want to) compete with powerful analytic tools like Kissmetrics, Mixpanel, or FullStory. Our ultimate goal is to create a tool that sends relevant messages well, so our analytics features will most likely be “necessary and sufficient” to provide quality event triggers. We’re extremely close to launching our MVP, and we can’t wait to invite folks in. Feedback from our first users will help us validate — or rethink — whether Userlist.io has the right mix of core features to truly deliver value. Even at this early stage, though, we’re hopeful that our focus on founders’ most common situations, struggles, and motivations leads to a product that makes self-funding a SaaS company 10x easier. 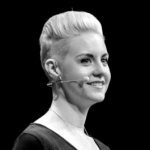 Want a copy of the interview questions & spreadsheet template Claire used for customer research? Enter your email address below and we’ll send you both resources.